Place: Chidorigafuchi Park, Hanzomon Gate, Imperial PalaceRun! Walk!Enjoy the palace & city view while supporting TELL! and the world to Japan. The Pillowman April 20 ~ 22. A fascinating, edgy, very dark comedy. The script is excellently written, presenting a combination of disturbing and humorous material, but I do need you to be aware that there is dialogue about child torture and killings. The cast is top notch and the directing thoughtful, creative and engaging-- but even so-- not meant for kids. Defining Actions, a half-day symposium on the challenges facing the Tohoku recovery. Harvard Club of Japan invites you to Defining Actions,a half-day symposium, where YOU share ideas, best practices, and solutions to the challenges facing the Tohoku recovery. Creative and brilliant speakers will shake up your brain cells on Sunday morning. Open to the public. Registration fee covers travel expenses for Tohoku speakers, and tech equipment. Remaining profits are donated to Tohoku recovery projects. SO YOU WANT TO ATTEND Register by emailing Junko at junkokim@post.harvard.edu. Black Stripe Theateropens its 4th season with The Pillowman by Martin McDonagh, Directed by Liam Shea. Friday, Saturday and Sunday evening performances 7.30pm Saturday and Sunday matinees at 2p.m. Supported by Human Rights Now! 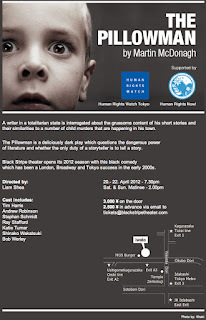 and Human Rights Watch Japan. Thursday, April 12, 20127:00-10:00 FEW April Meeting: "An Unprogrammed Life” Adventures of an Incurable Entrepreneur William Saito will tell us about his unconventional approach to business building, and how the entrepreneurial mindset and team building are important for any business situation. The 2012 Katerva Awards spotting season is in full swing! Our entire network has been mobilized and is focused on gathering paradigm-busting ideas at the intersection of innovation and sustainability. As part of the Global Spotter Network, you play an important role by identifying and nominating the best programs on the planet for recognition and award. The process is simple: out of the hundreds of ideas that you may be exposed to every year, recommend the one or two you feel are truly revolutionary. Simply fill out this short nomination form to recommend ideas, initiatives, projects or businesses for the Katerva Awards. We ask you to provide basic contact and descriptive information about the organization as well as the core principal that makes your nominee a “game-changer.” That’s it! Leave the fact-finding and validation to Katerva’s Research Team. Starting on Friday April 6, Give2Asia will launch Link2Asia, a weekly roundup of news from the third sector in Asia. Link2Asia will be available each week on Friday morning in the headlines section of our blog. Secretary of State Hillary Clinton honored Give2Asia partner Chintan for its work placing waste pickers from Indian slums into schools and safe jobs. Waste pickers earn a living by salvaging paper, plastic and metal from waste dumps and selling it to recycling centers. Chintan Environmental Research and Action Group was one of three organizations honored with the Secretary's Innovation Award for the Empowerment of Women & Girls in Washington D.C. last month. "Chintan's efforts have reached more than 20,000 waste pickers in India in the past five years. More than 2,000 children have been pulled out of the trash heaps and put on a path toward education and opportunity," Clinton said. Read more about Chintan by clicking here.